Simple lunch or dinner. Grilled fish, salad with feta cheese and an olive oil dressing. You could certainly add some energizing carbohydrates (beans, a sweet potato, or even quinoa sounds good for this meal). I didn’t have any of those options in the cabinet at the time. Don’t forget, main meals need 4-6 different food groups to be balanced. Just think about getting 4-6 different food groups to be balanced. Salmon served up an omega-3 rich (heart healthy) protein. Spinach with pico provided veggies and spice. Sliced mixed fruit. And ranch for fat to anchor it all down. Strive to have 3-5 different food groups at breakfast to be balanced. Two eggs plus egg whites provided a protein and healthy fat. *Half a toasted bagel for a complex carb. A cup of fresh grapes for fruit. *Bagels tend to be very dense and high in calories. There are good uses for an entire bagel: pre- (intense) workout or long run, bulking up, or you’re not trying to manage your weight. Don’t give them up entirely, don’t eat them allllllllll, alllllll the time. Salmon patty (from frozen) provides a lean protein. Starchy vegetables give a complex (fiber-rich) carbohydrate. Steamed zucchini and squash for more veggie love. No fruit or dairy at this meal. The vegetables were tossed in olive oil for healthy fat. Four good food groups. Another meal made out the rainbow 🌈 thanks to Choctaw Fresh Produce! I enjoyed this beautiful salad at Pear River Resorts. It was a gorgeous mound of deliciousness. While I’m a cheese lover, this is a tad much for one salad. What you don’t see is I removed about half and sat it to the side, and proceeded with my mega mixture. Grilled chicken provides a lean protein. All the fresh vegetables. Yep, I ate the bread stick for my carbohydrate (I did, however, pass on the crackers brought with it). Some cheese for a dairy and I sparingly used ranch dressing on the side. Main meals need 4-6 different food groups to be balanced. Learn more about Rate Your Plate. Breakfast, my favorite meal. Ultrafiltered milk provides plenty of protein. Whole grain waffles, a banana and peanut butter for healthy fat. Your breakfast needs 3-5 different food groups to be balanced. Learn more about Rate Your Plate here. Remember, a VARIETY of food is the best thing you can do to get a VARIETY of nutrients your body needs on a daily bases. Singular food groups provide singular nourishment. Post workout brunch. If your workout takes you less than an hour to complete, and you’re going to be eating a meal within the next 1-2 hours (breakfast, lunch or dinner), there is no reason to have a post workout shake or snack (unless you’re trying to gain weight). Powerful nutrients create powerful bodies. Your workout isn’t complete until you’ve to refuel. Excellent fish sandwich, on wheat bread, tomatoes and carrots for veggies, and mayo for the fat. *Even if you haven’t worked out, this is a fabulous lunch. Utilize leftover fajitas by adding egg whites to make them stretch for two. Protein and fat come from the fajitas mix. Used a whole grain wrap at home for added fiber and lower calories (than restaurant wraps). Paired it with a side of fresh greens and salsa for vegetables. Main meals need 4-6 different food groups to be balanced. Learn more about Rate Your Plate here. Put your oven to work. Pork tenderloin for a lean protein. Sweet potato for a complex carb. Roasted Brussels sprouts for a veggies. No fruit or dairy at this meal. Olive oil on the sprouts for a healthy fat. A powerful post-workout lunch (but well balanced for any time). Grilled chicken provides protein for repairing muscle. The whole grain bread helps replenish my energy stores. The bread has a laughing cow cheese wedge (not enough dairy to count as a serving) and sliced tomatoes. Bonus veggies with the Brussels sprouts leftover from dinner. Olive oil used in cooking both the chicken and sprouts offer a healthy fat. You can enjoy weekend favorites (like Rotel dip) during the week! Rotel dip is delicious, but let’s face it, not the most nutritious. But that doesn’t mean you must toss all the leftovers come Monday. Tuna provides a lean protein on a bed of veggies. *Chips offer a carb and a small serving of well portioned Rotel gives a dairy and the fat. Normally, I’d eat ranch on any salad, but I wanted the Rotel more, so I compromised and used a lemon wedge with a flavored tuna packet. No dressing was needed. Scroll to learn about the chips. The chips are my favorite. Notice the fat comes from heart-healthy sources, there are 5 grams of fiber, 0 grams of sugar and 4 grams of protein! 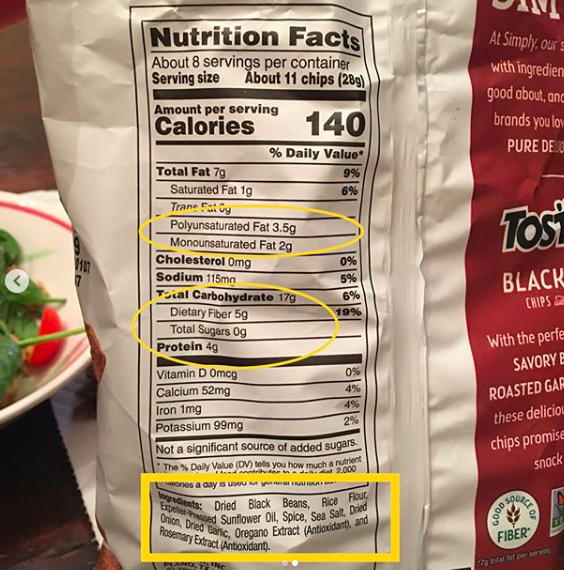 Check out that ingredients list: actual black beans! **Note** These are still chips. They are not magical unicorns 🦄 in the chip aisle. However, if you like chips, try these - they are a delicious addition to your pantry that offer nuggets of nutrients not always found in other chips. (Not sponsored)! Spaghetti. Nothing special here, but a sneaky little veggie. Lean ground meat provides a quality protein and pasta for the energy proving complex carbohydrate. Add in grated zucchini to your sauce (whether homemade or from a jar) for more fiber and phytonutrients. Paired with cooked zucchini and squash, seasoned in olive oil for the heart healthy fat. Just because it’s pretty, doesn’t mean it took much effort to make. Grilled chicken, with a spinach and pepper salad, and homegrown (thanks neighbors) potatoes, baked at 425 for about 45 minutes (seasoned with salt and tad bit of olive oil.). There is ranch on that salad for my fat. Not all fast food is awful waffle. This was at Backyard Burger. Grilled chicken for a protein. No specific complex carb (although there was a package of croutons). Veggies, and cheese for the dairy. Ranch on the side for a fat. FYI: The fries are amazing (per the husband’s plate), and I may have helped Neely with her milkshake. No shame. 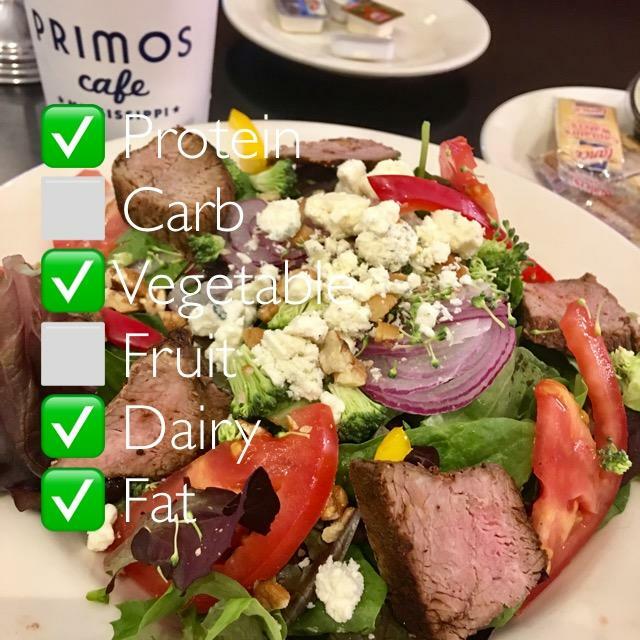 f you haven’t had the black-n-blue salad at Primos you’re missing out! It even rates right (if you get the dressing on the side). I love summertime and all it’s colorful veggies! It’s easy to eat the rainbow during the summer months. Main meals need 4-6 different food groups to be balanced. Today, I enjoyed leftover steak for a protein. A starchy summer salad gave me my carbohydrate (plus extra veggies) and small salad with a glob of ranch. Remember, nutrients found in whole foods are your body’s worker bees. Choose a variety of food groups to get a variety of talented worker bees. Breakfast of a busy mom, who doesn’t have time to “cook” something. Everyone has time to mix a bunch of goodies in a bowl. Since Rate Your Plate is based on balance of different food groups to provide a variety of nutrition, Breakfast meals should have 3-5 different food groups. Greek yogurt gives a hearty protein and the goodness of dairy. Old fashioned oats for a complex carb, and cantaloupe is a fruit. Stir in 1 Tbsp of peanut butter to provide a plant based fat that will keep you full and satisfied. Get creative with a fruit, oats and yogurt bowl. Summertime offers fruits galore! Any fruit can change the entire experience. Don’t get stuck in a fruit rut.